CollegeBudget.com has just been featured in the Empact100 list, recognizing the top 100 companies run by young entrepreneurs age 30 or younger who impact our economy. As a result, the CollegeBudget team has been invited to a recognition presentation at the White House. CollegeBudget is a startup dedicated to making college more affordable by implementing student discounts and collective buying in the retail, textbook and student loan space. More simply, they are like the Groupon for college, specializing in college daily deals. Our own CampusBuddy founder, Mike Moradian, is also the co-founder and president of CollegeBudget. If you have any questions that you would like to ask the White House, please message us or post a response to this message. Also: CollegeBudget is currently ranked #2 in the Empact100 list. Help the team get to the top spot: vote here. Young entrepreneurs are not just America’s future. They’re America’s present. The Empact100 list represents the talent and potential of today's young entrepreneurs. It is meant to inspire others to join the movement to revitalize our economy by starting a business. Founder and CEO of CollegeBudget.com allows world to vote on whether he attends Harvard Business School or remains at CollegeBudget.com. LOS ANGELES, August 8, 2011 — Mike Moradian, the founder and CEO of CollegeBudget.com is faced with an incredibly difficult decision - whether to attend Harvard Business School, a top-ranked MBA program at one the most prestigious universities in the world, or forge ahead with his newly launched startup, which seeks to revolutionize student discounts and finances. “They are both opportunities of a lifetime, but in order to make an impact, I can really only choose one” says Moradian, who was ranked America’s Best Young Entrepreneur in 2010 by Bloomberg Businessweek. In a totally unprecedented move, Mike has opened up his decision to attend Harvard to public vote at ShouldIgotoHarvard.com. Over 20,000 people have cast their votes since the poll opened up last week to users of CollegeBudget. Today, the poll opens up to all members of the public. “I’m taking this very seriously” says Moradian. Over 100 companies have already signed up to give limited time students discounts of 50% off or more. BookRenter.com, a textbook rental service, is currently offering 60% off the cost of Textbook Rentals through CollegeBudget only. This deal is available on CollegeBudget from Monday, August 8th through Friday, August 12th. CollegeBudget.com officially launched on August 1, 2011. It aims to revolutionize student deals and reduce the costs of college life for students across the nation. The service saves students money through exclusive discounts and collective social buying. In addition to student deals, CollegeBudget aims to bring collective social buying and most importantly deep discounts to every facet of the college student experience, including textbooks, student loans, and potentially one day even tuition. CollegeBudget currently represents over half a million college subscribers and has already saved students over one million dollars collectively. CollegeBudget.com is a student only deal site dedicated to saving students money. Have you had a chance to use the site yet? Has it saved you money? If so, what type of deals have you bought? Leave us your reviews, ratings and comments in the comment section. Thanks! CollegeBudget.com officially launches today aiming to revolutionize student deals and lower the costs of college life for students across the nation. The service saves students money through exclusive discounts and collective social buying. In addition to student deals, CollegeBudget aims to bring collective social buying to every facet of the college student experience, including textbooks, student loans, and potentially one day even tuition. The company is kicking off with Back-to-School Palooza featuring over 100 merchants lined up to give 50%+ off their services, only to college students. 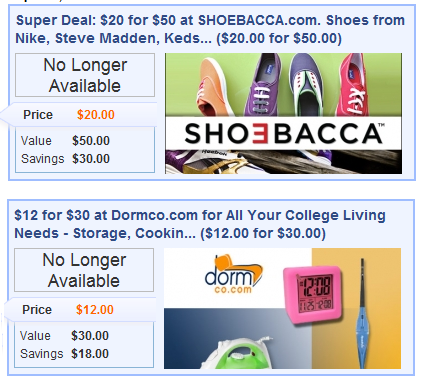 Since launching in private beta in March 2011, CollegeBudget has already grown to become the leading student deal site. CollegeBudget currently represents over half a million college subscribers and has already saved students over one million dollars collectively. CollegeBudget.com offers the ideal way for national brands, e-commerce sites, and local businesses to attract the college crowd. The CollegeBudget service uniquely ensures the exclusivity of student discounts by requiring members to provide a valid .edu e-mail address in order to buy. CollegeBudget also distinctively delivers a complete social media marketing campaign to merchants, with no upfront cost. Merchants who sign up to offer student deals through CollegeBudget receive a YouTube testimonial video made by a real college student, and social media blasts to CollegeBudget’s over 130,000 Facebook Fans and 3,000 Twitter Followers. Wow, students have really responded to the call to save money collectively on CollegeBudget.com. Since it's launch this year it has saved students hundreds of thousands of dollars on everything from shoes, to filtered water bottles to clocks that run away. It is clear that CollegeBudget is no scam. Over 115,000 students have liked their page on Facebook, making them one of the top Facebook pages in the college space already! If you have not had the chance to join CollegeBudget yet, do it now. While the deal of the day is not for everyone, keep following the daily deals and rest assured you will shortly. Who doesn't love a good student discount? Join CollegeBudget now and you're going to love it. We're always excited to show off hot new items to college students, and today we have a real treat! CollegeBudget.com is a new student discount and college daily deal site. One of the key differentiators of this site is that fact that you must have a .edu e-mail address to use the service. Student deals are always a perk when you're on a CollegeBudget. Make the most of you're .edu e-mail address and enjoy the savings now.